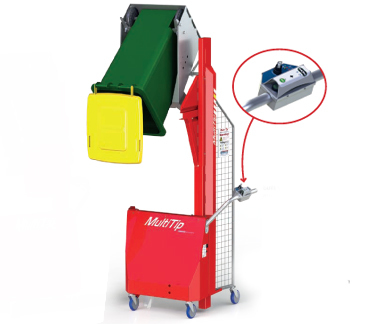 The Multi-Tip bin-tipper 1200 from Optimum Handling Solutions offers the perfect solution to the problems of emptying heavy MGB bins and drums into larger bins for disposal. 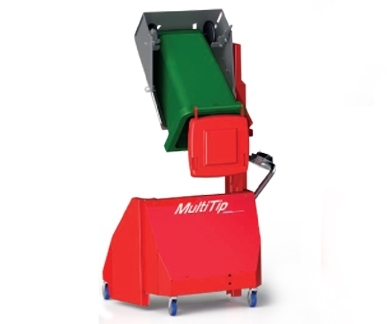 Optimum Multi-Tip bin-tippers require no regular maintenance, and are robustly built yet light and easy to move around. 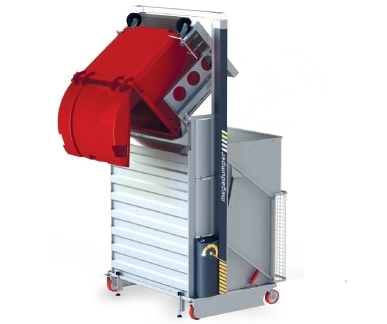 Optimum Multi-Tip bin-tippers are designed to be safe to use, with all operating components fully enclosed. 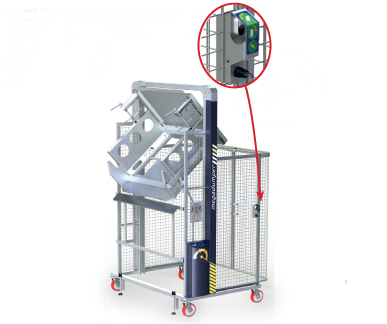 PDS - Multi-Tip tippers are available with a personnel detection system (patent pending) that works in a similar way to reversing sensors on a car. 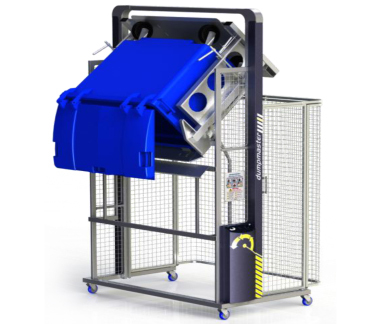 The sensor system detects people within the danger zone and stops all motion of the cradle, but is programmed to ignore the movement of the cradle itself. If you'd like more information or if you have any enquiries about Multi Tip Bin Tippers, please call 1800 066 008 or click HERE to contact us online and we will contact you. 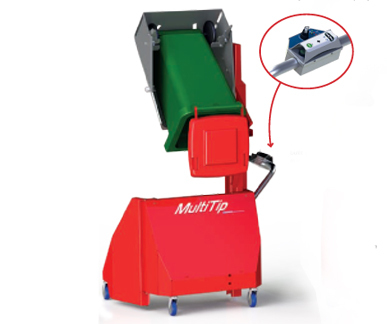 The Multi-Tip bin-tipper 1600 from Optimum Handling Solutions offers the perfect solution to the problems of emptying heavy MGB bins and drums into larger bins for disposal. 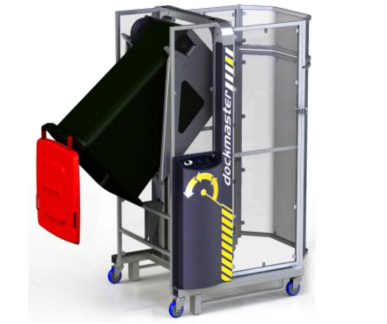 Dumpmaster ‘standard series’ bin-tippers are an ideal solution for emptying bins and drums weighing up to 300kg at virtually any height. The tipping action of a Dumpmaster is one of the safest, most efficient, and easiest to use systems in the world. 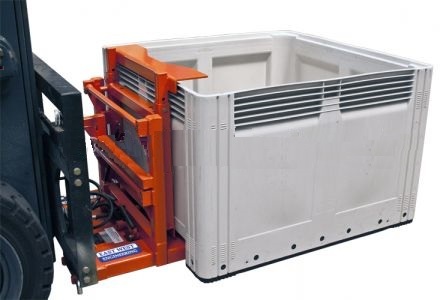 Dumpmasters are highly versatile and can be used in numerous applications, ranging from emptying rubbish bins into skips to pouring food ingredients into hoppers or mixers. No matter what the application, Dumpmasters have proved to be safe, reliable and economical to operate, year after year. 4 standard tipping heights, but can be economically built to tip at any height. 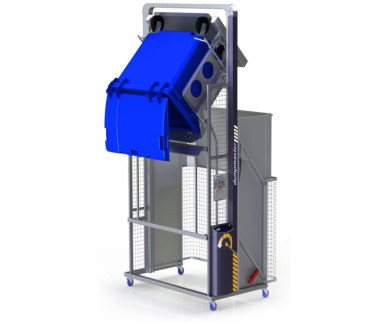 Cradles are available to suit virtually any size and shape of bin. 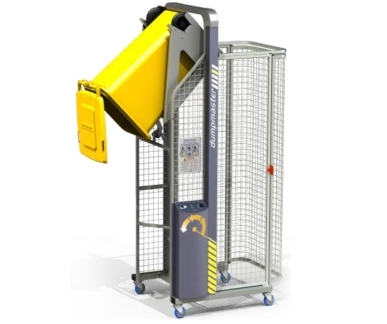 A range of accessories is available to provide additional features or functionality for Dumpmaster bin-tippers. Many of these features can be retro-fitted to existing machines. Swing-up door: A swing-up door supported by gas truts may be fitted instead of the standard side-hinged door(s). Operator Guard: A polycarbonate guard screen is available to protect the operator from glass or chemical splashes. Solar Panel: Machines that are used outside can be fitted with a solar panel. Certified Door latch: Approved door switches can be fitted if required. If you'd like more information or if you have any enquiries about Dumpmaster 'Standard Series', please call 1800 066 008 or click HERE to contact us online and we will contact you. Optimum ‘Wide Series’ Dumpmasters employ the same efficient tipping geometry as the well-proven ‘Standard Series’ machines. 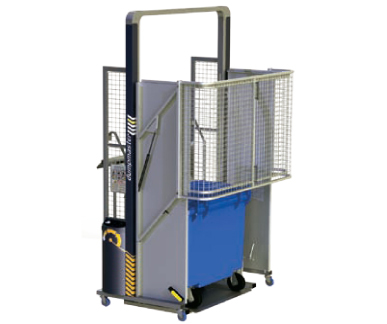 They are available with cradles to suit a range of larger bins, including 660l, 1000/1100l wheelie bins, or square and rectangular bins. 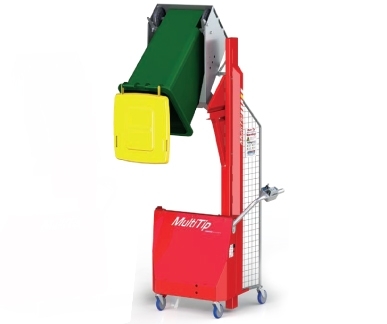 Attachments are available to enable multiple bin sizes to be tipped, for example a cradle for tipping 1100l bins can be fitted with auxiliary catches to enable all standard wheelie bins from 80 litres up to 660 litres to be tipped as well. No adjustment is required for tipping the different sizes – simply wheel the bin in and empty it! Optimum ‘Wide Series’ Dumpmasters can be made to tip at any practical height. They normally have a hot-dip galvanised frame and cradle, with zinc-plated guarding. However, some or all of the machine components can be made from stainless-steel for use in hygiene-critical areas or harsh environments. If you'd like more information or if you have any enquiries about Dumpmaster 'Wide Series', please call 1800 066 008 or click HERE to contact us online and we will contact you. MegaDumper 660 bin-tippers are the heaviest-duty models in Optimum's comprehensive range of bin-tipping machines. 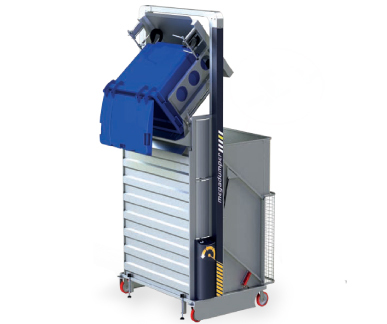 Although similar in appearance and operation to the ‘Wide Series’ Dumpmasters, all components are up-rated to cater for bins weighing up to 750kg. Optimum MegaDumper 660 bin-tippers have a unique tipping action whereby bins are lifted straight up, then gently rolled forward around the lip of the skip or hopper being emptied into. Benefits of this design include a small ‘footprint’, and a wide range of tipping heights available (from 700mm to 6 metres or more). Optimum MegaDumpers 660 may be mounted on four castors with no loss of stability. MegaDumpers are available with weight capacities of 450, 600, and 750kg. The basic componentry is the same for all models, except the lifting ram. 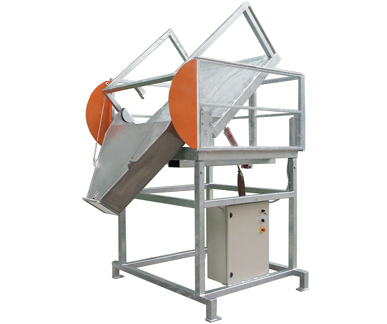 The operating speed is generally proportional to the weight capacity – machines with more weight capacity run slower. MegaDumpers can be built to any practical tipping height. 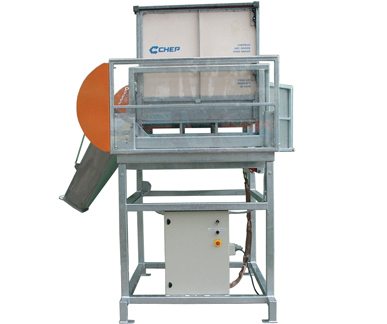 Standard MegaDumpers have a galvanised frame and cradle, and are virtually maintenance-free. MegaDumpers are available either with full stainless steel construction, or with selected components from stainless-steel for critical hygiene areas or corrosive environments. 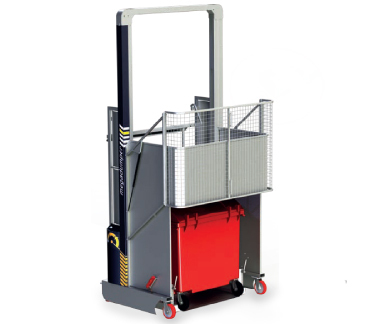 Cradles are available to empty either a single size of wheelie bin, or multiple sizes, or many other types of square and rectangular bins. Standard drums and bins do not require clamping – simply place on the cradle and press the ‘Raise’ button. 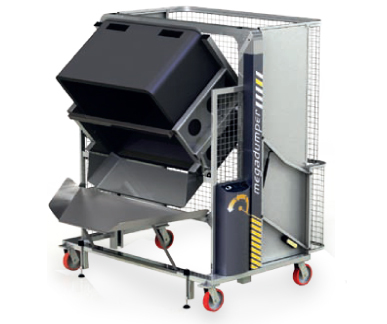 A range of accessories is available to provide additional features or functionality for MegaDumper bin-tippers. Many of these features can be retro-fitted to existing machines. Panel: All panels including the door can be made from steel sheet or welded wire mesh. If you'd like more information or if you have any enquiries about Mega Dumper 660, please call 1800 066 008 or click HERE to contact us online and we will contact you. 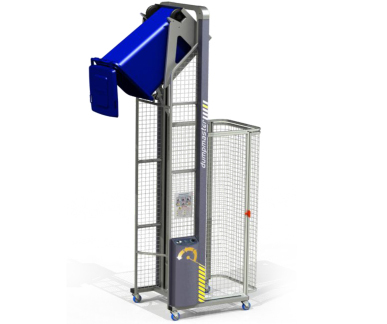 MegaDumper 1100 bin-tippers are the heaviest-duty models in Optimum's comprehensive range of bin-tipping machines. 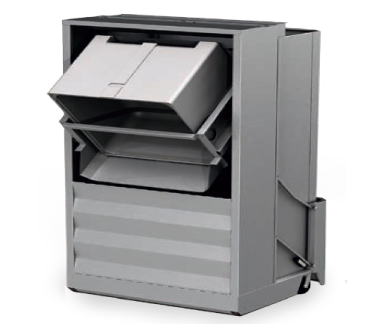 Although similar in appearance and operation to the ‘Wide Series’ Dumpmasters, all components are up-rated to cater for bins weighing up to 750kg. 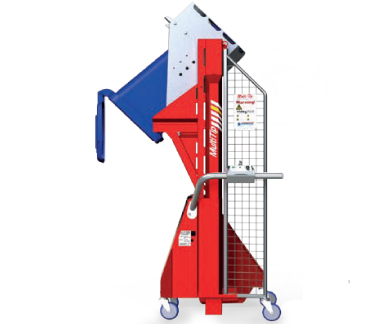 Optimum MegaDumper 1100 bin-tippers have a unique tipping action whereby bins are lifted straight up, then gently rolled forward around the lip of the skip or hopper being emptied into. Benefits of this design include a small ‘footprint’, and a wide range of tipping heights available (from 700mm to 6 metres or more). Optimum MegaDumpers 1100 may be mounted on four castors with no loss of stability. If you'd like more information or if you have any enquiries about Mega Dumper 1100, please call 1800 066 008 or click HERE to contact us online and we will contact you. 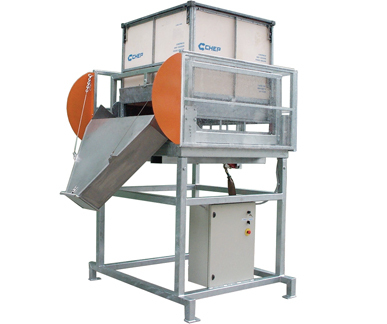 If you'd like more information or if you have any enquiries about Raised Bulk Bin Tilter, please call 1800 066 008 or click HERE to contact us online and we will contact you.